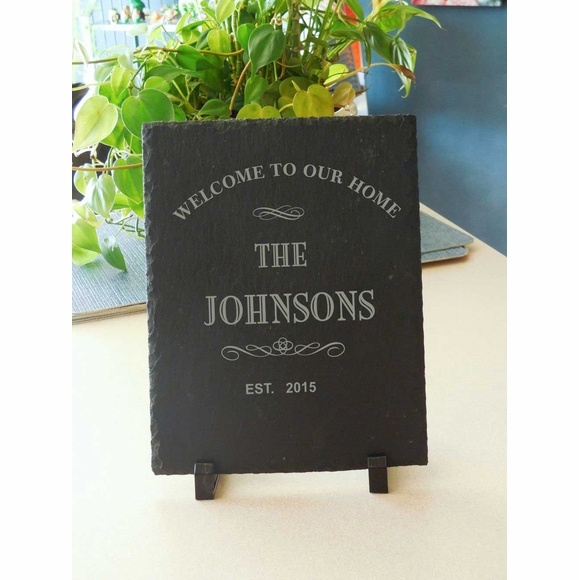 Welcome to our Home Plaque - - personalized with the family name and established year you supply. Made of black slate. Designed to stand upright on a desk, dresser, or table. Includes two black plastic table supports and soft non-marking bumpers that allow the plaque to be laid flat on a table with the engraved monogram facing up. Made from solid hand-cut, fine-grained slate. Makes an impressive housewarming gift, hostess gift, host gift, graduation gift, or birthday gift. Also perfect for that someone who has everything. Family name line holds up to eight (8) 1" or up to fourteen (14) 3/4" characters. Established year line holds the year in XXXX format. The decorative accents, arched shape "WELCOME TO OUR HOME" at the top, "The" in the middle, and "EST." at the bottom are all part of the design. The wording and accents are permanently laser engraved into the slate: not painted or printed on. Dimensions: 8"W x 10"H x 1/4�. Color: black slate with gray wording and artwork. Care: to hide any scratches, rub mineral oil into the slate. Slate is a natural crafted item so the dimensions and finish may vary slightly from piece to piece. 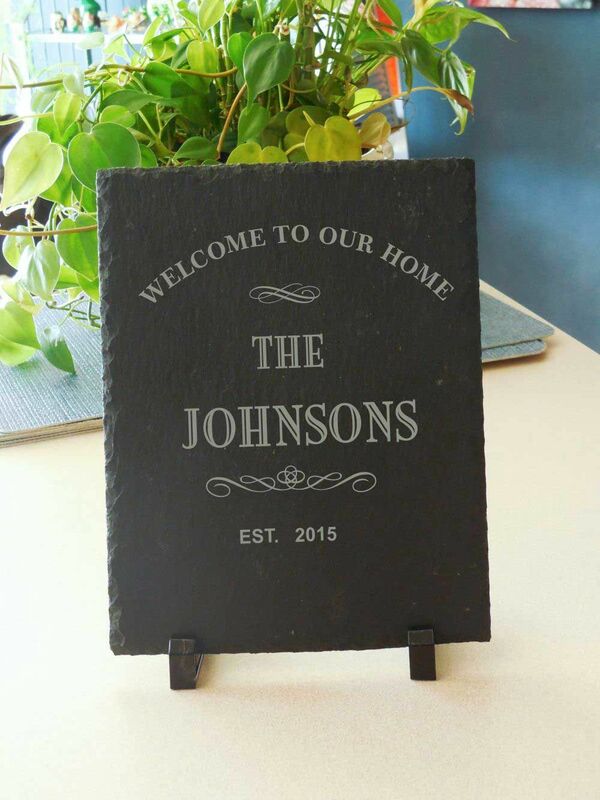 Black slate Welcome to Our Home plaque for indoor tabletop or desktop.